I’m pleased and excited to announce my fourth philosophical-historical themed adventure, this time in Paris, France to follow in the footsteps of Thomas Paine, Mary Wollstonecraft, and Thomas Jefferson at the time of the French Revolution. The French Revolution, following on the heels of the American Revolution, inspired and horrified many. The financial crisis, caused by over-expenditures in recent wars (including assistance to the Americans) and food shortages, caused by a series of crop failures, led to an uprising mostly of professionals and merchants, joined later by members of the laboring classes. The movement for reform called for disestablishment of the monarchy, who entangled the nation in wars and continued to spend lavishly in times of want, and for ending the special privileges of the aristocracy and clergy, whose tax exemptions often placed the heaviest financial burden on those who could least afford it. 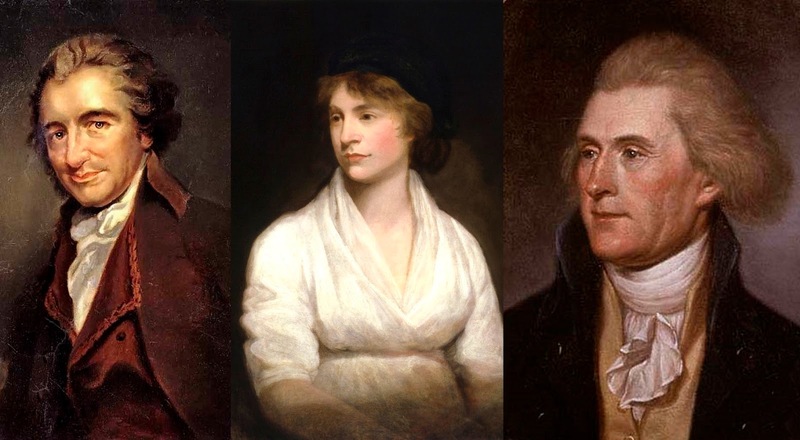 Thomas Paine, Mary Wollstonecraft, and Thomas Jefferson were three Enlightenment thinkers whose work is central in the intellectual legacy of modern human rights movements, and who were heavily influenced by the French Revolution. Paine, a British-born corset-maker who became involved in local politics and reform movements in his native country, in America, and in France, set down his political theory and freethought philosophy in Common Sense, The Rights of Man, and The Age of Reason. Mary Wollstonecraft, who was also born in England and also moved to Paris to take part in the revolutionary activism taking place there, followed Paine’s The Rights of Man with her Vindication of the Rights of Woman, now considered the founding work of the modern feminist movement. Thomas Jefferson, founding father of the United States and eventual President, was an American statesman living in Paris as the events leading up to the French Revolution unfolded, and continued to defend its core democratic values, if not all its tactics, even as it devolved to the bloody Terror. So off to the Paris I go! There, from August 9th through the 21st, I’ll visit landmarks associated with their lives at this time, and see how the events that occurred at that time in the places where they lived, worked, died, thought, wrote, studied, rested, and played contributed to their thought during and after the Revolution. This entry was posted in Feminism, History of Ideas, Traveling Philosophy / History of Ideas, Written by Amy Cools and tagged feminism, France, French Revolution, History of Ideas, http://schemas.google.com/blogger/2008/kind#post, Human Rights Movement, Mary Wollstonecraft, Paris, Thomas Jefferson, Thomas Paine, travel blog, Traveling Philosophy Series. Bookmark the permalink.